Parallels on Tuesday announced the availability of version 4.0 of Parallels Desktop for Mac, a speedier and more feature rich version of its virtualization software that lets users to run Windows, Linux and other operating systems side-by-side with Mac OS X. The new version of the software improves OS integration, performs up to 50% faster and incorporates a range of security, backup and power saving features. Among the core advances introduced in version 4.0 are support for DirectX 9, DirectX Pixel Shader 2.0 and OpenGL 2.0, which deliver faster video performance, and Adaptive Hypervisor, which lets users dynamically allocate resources to Windows programs or Mac applications on the fly. Together, the features combine for more responsive applications and a virtualization engine that's optimized to consume 15-30% less resources than earlier versions. Mac notebook users in particular should see up to a 20 percent improvement in their battery life thanks to the aforementioned improvements and another new feature called Parallels PowerSaver. Meanwhile, FastLane Architecture maximizes speed and performance by fully leveraging the latest Mac hardware, taking full advantage of up to 8-way true multi-core CPUs and 8 GB RAM per virtual machine. The growth, in both performance and ease of use, of desktop virtualization software is making it easier for Windows users to adopt Macintosh computers," said Michael Rose, Industry Analyst at the research firm, IDC. "The availability of this technology is one of many factors driving growth in the adoption of Mac desktops and notebooks, for which shipments have grown 46.6% between the first half of 2007 and the first half of 2008, according to our data." Parallels Desktop 4.0 for Mac also bundles at no extra cost $175 worth of additional components to addresses the areas of security and backup. These include Parallels Internet Security powered by Kaspersky for anti-virus, firewall, scanner, recovery, filtering and identity protection as well as Acronis True Image Home backup and restore and Acronis Disk Director Suite disk management. Adaptive Hypervisor lets you assign priority for allocation of Mac hardware resources to Windows programs or Mac applications..
Additional features specifically for Developers and IT administrators include Mac OS X Leopard Server and Windows Server OS support, VM Directory, CLI and Scripting support, SDK and API, PXE Boot, improved networking and VM Templates, and an iPhone remote control application that can turn virtual machines on and off. In total, Parallels says version 4.0 introduces 50 new features, of which other notables include SmartGuard automated backup, Smart Connect for remembering preferred USB connections, full-hardware ACPI power management, additional Screenview modes, Clips for screenshots, Speech Recognition, Security Manager, a Safe Mode, a Shut Down Mode and Over 45 Supported Guest OSs. Modality lets you Scale Windows right on your Mac desktop to monitor and view multiple VMs all on a single screen. The release comes wrapped in a new interface that delivers an easily accessible list of virtual machines that include favorite apps on each machine. At any time, users can view settings for a virtual machine and customize the toolbar to have favorite actions show up as buttons. 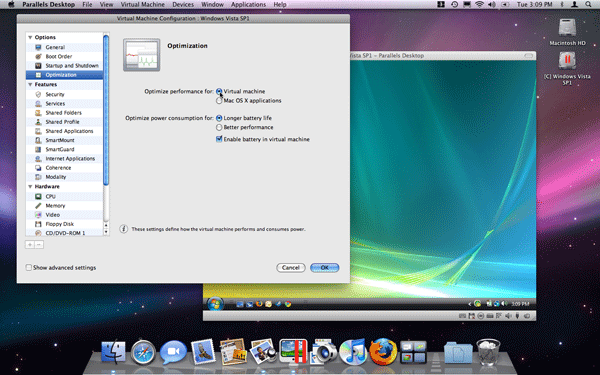 Parallels Desktop 4.0 is the latest step taken by Parallels in its bid to keep up with and potentially outrun rival VMware, whose Fusion virtualization software has been well regarded for its overall performance. Together, the two companies have sold over 1.5 million copies of Mac virtualization software, which is expected to drive the Mac virtualization software market into a $15 million - $20 million business this year. Parallels Desktop 4.0 for Mac is available for immediate download for $79.99 from Parallels' website. New users can test a free, fully-functional copy for 15 days. Current Parallels Desktop users can upgrade their existing software for only $39.99  a 50% off promotional price available until November 30, 2008. Users that purchased version 3.0 on or after September 1, 2008, qualify for a free upgrade to version 4.0. 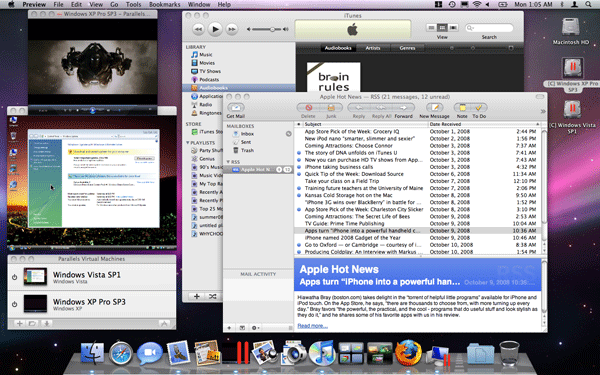 In September, AppleInsider revealed much of the Parallels Desktop 4.0 feature set in an exclusive report.